Giveaway Time! Hit the Banks at Crave! | The Food Hussy! Giveaway Time! Hit the Banks at Crave! 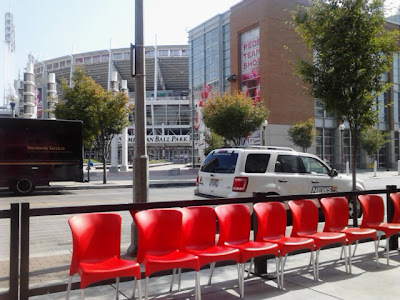 If you haven't noticed, The Banks have exploded in the last year - there are restaurants, condos and bars everwhere down there - even a couple of park-like areas! One of the new places that opened about five months ago is Crave. Inside - it's pretty impressive. It's very big but there are cute little pockets. They even have larger private tables that you can pull a curtain around for a much more private homey atmosphere. 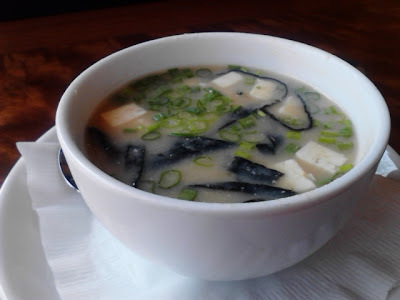 My coworker got the miso soup - which I think was billed separately from his lunch selection. It looks great doesn't it - so many chunks of good stuff. Matt said it was okay - but salty. 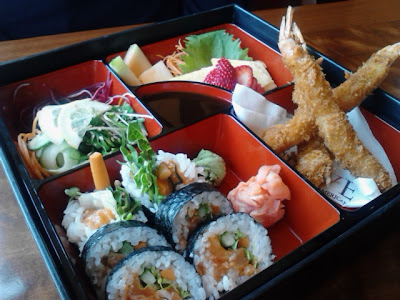 He also got the Premium Bento Box ($13.95) - it came with a choice of a roll, panko fried shrimp, seaweed salad and fresh fruit sashimi. This LOOKS beautiful. Matt said it was okay - but nothing too spectacular. and Fruit sashimi is cut up fruit - clever name though. And I have to say - it's a lot of food and does look sooo good! 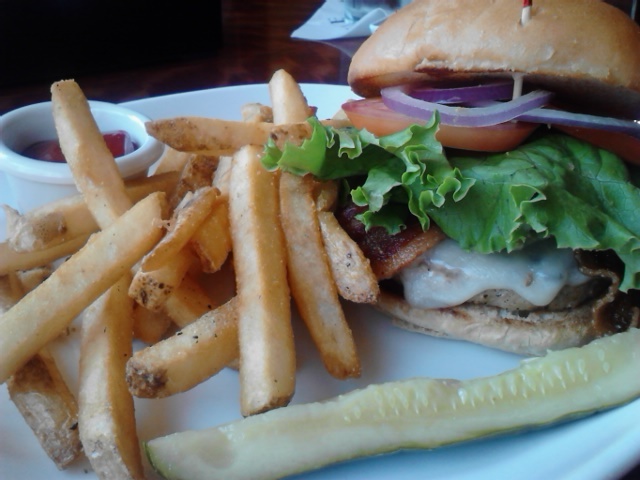 I, on the server's recommendation, went with the Turkey Avocado Burger ($11.95) and fries. This was a good burger - you could tell the turkey was probably a reasonably lean ground turkey. I've had quite a few different kinds of turkey burgers - the better they taste, the worst they are for you. The healthiness though - obviously mutilated with cheese, bacon and sriacha aioli. Why Should You Go? Well the view is great - and the food was fine - but our ticket of $35 for lunch for two was a bit steep. 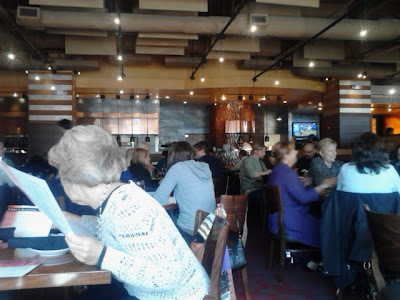 I think CRAVE is more about the atmosphere and the location. They do have a large menu - and I'd give it another shot and try something else. Lunch entrees are in the $10-15 range, dinner are in the $15-30 range. And now you can win $25 to try it for yourself!